Windows 8 Consumer Preview: what's new? So now we can all get a flavour of Windows 8 with the new Windows 8 Consumer Preview. 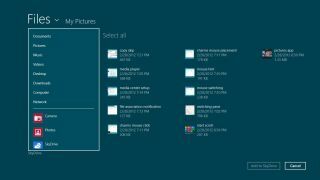 We've taken an in-depth look at the new OS in our Hands on: Windows 8 review and interviewed Microsoft about its new Windows. But what's changed? Well, pretty much everything. Last September's Developer Preview was a simple demonstration for - yep, you've guessed it - developers, to show them how Windows 8 Metro apps would work. While we could glean a lot from that version, it was nowhere near feature-complete. It wasn't even significantly near. This new Consumer Preview version brings a whole raft of product changes and improvements. Microsoft said today that it has made over 100,000 code modifications since the earlier build. Of the new version, Microsoft says that "with the added features, it represents a more complete view of the capabilities of Windows 8." "With Windows 8, we reimagined the different ways people interact with their PC and how to make everything feel like a natural extension of the device, whether using a Windows 8 tablet, laptop or all-in-one," said Steven Sinofsky, head of Microsoft's Windows division. As with the earlier preview, the new beta build still doesn't have a version for ARM processors - it's x86 for Intel and AMD-based systems only. However, Microsoft did demo the OS working on ARM hardware at the Consumer Preview launch during Mobile World Congress in Barcelona. As Mary Branscombe explains in our Hands on: Windows 8 review, it's therefore hard to get a complete grip on what the ARM experience will be like. As Sinofsky said previously, there will be no third-party apps on the Windows on ARM (WOA) desktop, though there will be third-party Metro apps. WOA will also have baked-in versions of the key Microsoft Office apps - this Consumer Preview version doesn't, and Windows for the x86 platform won't. Microsoft says that "Windows 8 has progressed across every dimension" from what we've seen before. The user experience for touch plus keyboard and mouse is now complete, says the software giant. The Consumer Preview is compatible with a mouse and keyboard as well as touch. The new Windows Store is now open (also in a pre-release beta version) with the Windows 8 Consumer Preview and, as we reported earlier, all apps are currently free. The store has a variety of new Metro style apps from third-party developers and Microsoft. The Consumer Preview also gives you the ability to take your apps and settings with you across multiple PCs. The Consumer Preview offers the ability to sign on with a Microsoft Account (the new name for your Windows Live ID or Microsoft Passport). That means you can store your stuff in the cloud - you can keep your settings in sync across devices, use cloud storage plus Windows Live services such as Hotmail and Calendar (the Windows Live name appears to be doomed). Of course, your stuff is also available on Windows Phone as well as your Windows PCs. The OS also features another preview version of the new Internet Explorer - Internet Explorer 10 Platform Preview 5. The browser has been reworked so it performs across all Windows 8 devices. The interface can be edge-to-edge in Metro and it's all nicely hardware accelerated. To use touch, you need a tablet or monitor that supports multi-touch. To access the Windows Store, download and run apps, you need an internet connection and a screen resolution of at least 1024 x 768. We'd recommend you don't install it on your main PC or, if you have no other option, you create a new partition to install it on so you don't ruin your current Windows installation. Download the Windows 8 Consumer Preview here and check out our Hands on: Windows 8 review.